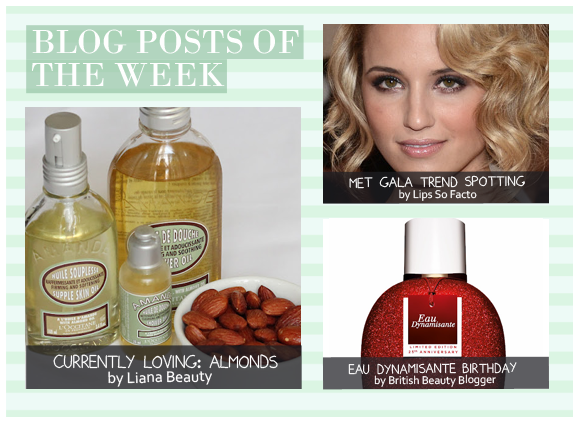 In this post Liana raves about what is quite possibly my favourite body range of all time, L’Occitane Almond. The decadent Shower Oil and Supple Skin Oil are Liana’s favourites of the bunch, and she also extols the virtues of the humble almond as a healthy foodstuff. There’s been a lot of talk about the Met Gala in the past couple of days, so we’re going to round off the week by talking about it just a tiny bit more. In this post Meg talks dark lips, dewy skin, subtly smokey eyes and big lashes, and also reveals the looks that were a fail. This week Jane brings us news of an upcoming lustworthy product. Clarins are celebrating the 25th birthday of perennial favourite Eau Dynamisante with a gorgeous glittery flacon that reminds us of Dorothy’s ruby red slippers. We can’t wait for July! This entry was posted on Friday, May 11th, 2012 at 8:00 am and is filed under Blog Posts of the Week. You can follow any responses to this entry through the RSS 2.0 feed. You can skip to the end and leave a response. Pinging is currently not allowed.